Meg and I are at that age, an age where we've got a lot of friends and relatives getting married. This year might have been the peak when it comes to number of weddings that we'll be going to though with five separate weddings attended. We started off early in the summer with Meg's cousin John's wedding. 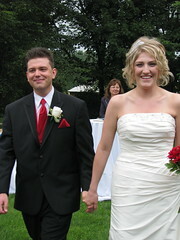 He and his new wife Ashleigh were married before they moved down to New York where John is doing his MBA at Columbia. Their wedding was at Trinity Church in downtown Toronto and the reception was just around the corner at a former-church-turned-hall called the Berkeley Church Heritage Event Venue, a pretty neat place. Next up was my friend Jeff's wedding in Ottawa. Jeff married a wonderful woman in Allison out at a Stanley's Olde Maple Lane Farm. It was a beautiful wedding outside and then a reception in a neat old farm house. The day turned out to be amazing, even after threats of rain. 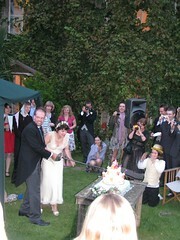 Not too long after that we flew off to England (to be blogged about later) and attended Meg's friend Robin's wedding. Robin and Helen were married in Bristol where they live. Unfortunately the long trip meant that Meg was the only highschool friend who could be in attendance. 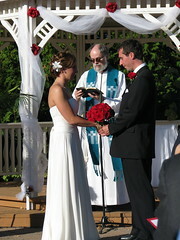 The wedding was at their church with the reception held at a neat country home a half hour outside the city. A few weeks later, back in Canada we went to our first Friday wedding. Adam and Andrea were married in Ajax and so we made our way to Belleville on the Thursday night. The next morning we spent working before driving to Ajax for the 5pm wedding at a beautiful golf course called Deer Creek. It was a fun night and a great chance for Meg to catch up with some of her university friend's from her time at Loughborough. 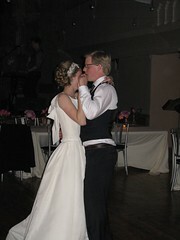 Finally we finished the wedding season off with a two day wedding spectacular for our friends Chris & Agnes. They were married over the Thanksgiving weekend at Agnes's parent's church in Manotick on the Saturday with a great cocktail reception at Plant Bath Recreation Centre. The next night we attended a 11 course Chinese dinner in celebration of the newlywed's. Well, that's it for 2009 weddings. At this point I can only think of one so far in 2010, but I'm sure there will be others in the end.